Posted on July 24, 2015 by Alison V.
Getting Married Quickly – not a good idea? Posted on May 8, 2014 by Alison V.
Women citing that they got married after (some time less than a year) and they have been married for (10+ years). The other half of the women saying that they aren’t married yet, and they are waiting 2+ years to tie the knot and/or they waited 2+ years to get married and that as a result their marriage is better/deeper/stronger/etc. To summarize, everyone thinks that their decision was the right one and the other side was wrong. I got married after knowing my husband for 9 months. I DO NOT recommend getting married as quickly as I did. Let me first make it clear that I don’t regret my choice to marry quickly. I love my husband very much and I am so happy with how my life has turned out. But I will be the first to say that I did not know Jeremy completely or fully when we got married. After knowing each other for 9 months we had just scratched the surface. I hadn’t seen him interact with his mother. I hadn’t seen how he would treat a sick animal. I hadn’t seen him sleep deprived or angry. I only knew part of who he is, and I liked what I had discovered enough to promise my future to him. Our marriage has taken work, of course, it’s not all luck. But luck certainly payed a big part of it. I am lucky that he is the kind of man who has infinite patience with his mentally ill mother. I am lucky that he cleans up our puppy’s trow up at 2am without a single complaint. I am lucky that he never yells, insults or curses at me when he is angry, no matter how sleep deprived he is. I am luck that he is a better man that who I thought he was when we got married. People are complex. To this day there are still things that I am learning about myself. So while you may be a lucky couple that ends up with 50+ years of happy marriage after getting hitched after 2 months. 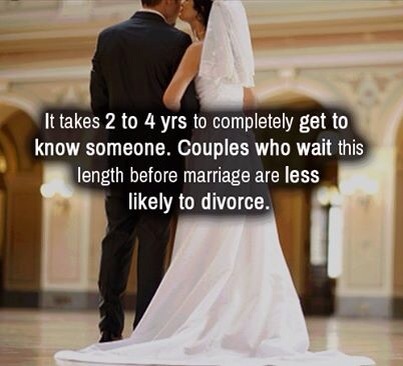 I think the chances of long term success are much higher if you take the time to truly get to know the person you will be stuck with for the rest of your life. Posted on May 16, 2013 by Alison V.
Today’s Wife 2 Wife topic is one that I was recently thinking about because of a pervious post I read today by another blogger that I follow regarding divorce and working on a marriage rather than giving up as soon as there is a bump in the road. A young military wife struggles with a husband who is showing signs of not being committed to their marriage. What would you say to her? This question immediately made me think of infidelity as the end result of “not being committed to their marriage”. I think my response to infidelity is different than what my answer to this question is, because I think that before a person has cheated, there is the opportunity to strengthen the marriage and fill in the cracks that are causing that person to look outside the marriage for companionship. My first advice is always communication. You can’t fix a marriage (or any relationship for that mater) if you don’t know what is wrong. Your spouse is the person you should be closest too, there isn’t anything that you should not be able to tell them. Even if that means telling them something that makes you uncomfortable…like your fears about them not being committed. After every thing has been openly talked about, I would recommend counseling. I may be biased because I am a therapist, but I think counseling can work wonders. Even if only one person goes, it can still improve the relationship. Both people going is obviously ideal with couples, so that both parties can make changes and work on fixing what was causing the relationship to be rocky in the first place. A marriage involves two people, and both people have to be willing to work on the relationship in order to have a long successful marriage. But what if only one person is willing to work on the marriage? Or what if he actually cheats? At what point does “divorce” enter the conversation? That is a more complicated question that I think every couple has to make on their own. I do feel that many couples jump to divorce without putting in the effort first to try to fix the marriage. But I also don’t think a person should stay in an unhappy marriage for years trying to fix it while the other person isn’t putting in the same effort. So I guess my advise would be communication and then counseling, because I do think that those two things can stabilize a marriage before it gets to the point where there is infidelity and divorce enters the conversation.